2) This is the kicker step… Open System Preferences -> Keyboard and Mouse -> Keyboard Shortcuts tab. Turn ON “Turn zoom on or off.” Then turn on “zoom” shortcuts as well. 3) In case you didn’t already know this sit back and watch the beauty. Apple + Option + Plus Key zooms in. Apple + Option + Minus Key zooms out. Apple + Option + 8 Key turns zoom on or off. 4) Head over to some online stream. zoom your mac way up. enjoy! 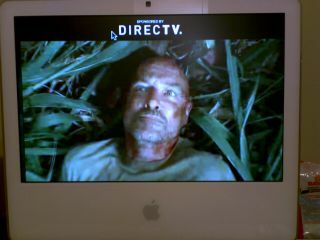 Here’s a photo from my cell phone cam showing the video size on my 20 inch iMac. The only fall back is that the os zooms to the mouse. So you’ll have to drag the window to the very top of the screen, then zoom and try and move the mouse out of the picture range while maintaining the video on-screen. I’ve yet to find a solution that you can hide the mouse with. Anyone know of any solution to this? There are a few more little fun tricks in the shortcuts menu we just looked at, like Apple + Control + Option + 8 inverts the screen. Just some more wow factor for Mac OS. If you’re watching the video in your web browser and you want to get rid of the curser, simply press one of your arrow keys. It’ll scroll, and your cursor will disappear. Then you can press the other arrow key and scroll back. Thanks for the tip, that arrow key/cursor trick works great! I love the zoom feature. I used to freak out fellow Mac users in my class by inverting the screen and zooming right into the mouse. Hours of fun I say. But yeah, like mentioned above, just scrolling with the up and down arrows will get rid of the cursor. I’m going to try this next time I miss an episode of something! So if you’re not watching it in a web browser, still not solution correct?